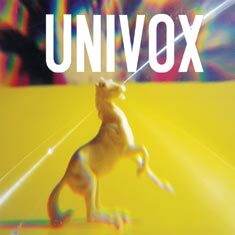 A little bit of Iggy Pop influenced vocals, some driving garage rock beats, and some prevalent four-part harmonies make up the main ingredients for the debut album from Univox. This four-piece band from Philadelphia gives the listener a sound so intermixed in various musical styles it’s hard to categorize their tone. The album opens up with the extremely catchy garage rock tune “Pi” and moves on to the driving indie acoustic guitar ditty “Everybody Knows.” The move between electric and acoustic is a constant theme through this album. All though the album, each member contributes a piece of the vocal harmonies that at times echo a doo-wop vibe, especially during the 10th track “Conan.” Another interesting vocal contribution occurs during the a cappella dirge, “All This Blood Came From My Heart.” I don’t know whether to take the song seriously due to subject matter and the odd and silly sounding intonations. It almost sounds like something created by Monty Python. STIMULATORS – Loud Fast Rules! The last two songs on the album, “Mind Traveler’s Song” and “Nobody’s That Smart,” return back to that rockin’ vibe that started the album with “Pi.” Technically speaking, the mixing and production quality is well executed. Everything is mixed to accompany each other rather than over powering another. This album has some really upbeat tracks that will get the foot a-tappin’, along with some somber and low-key acoustic pieces that add some emotion to the mix. An interesting album full of ups and downs.